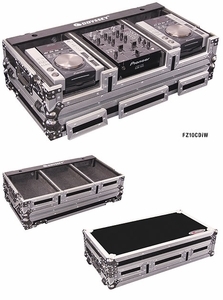 CD DJ Coffins hold two tabletop CD players and one mixer. These ATA Rolling Consoles feature rugged built-in wheels, heavy duty spring loaded latches, stackable ball corners, and front access panels. Cabling is clean and easy through convenient access ports throughout. Width Height Depth 21.5" 15" 23.75"
Width Height Depth 21.875" 15.375" 24.125"
Width Height Depth 34.6" 9" 19"